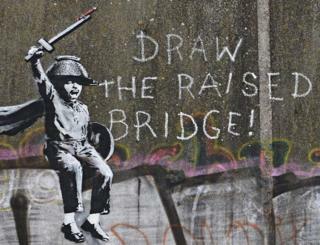 Graffiti artists in Hull have been given permission to spray sections of wall near a new Banksy mural. Bankside Gallery said it aimed to create a "street art quarter" from Clough Road to North Bridge, near where the Banksy appeared in January. The group has been given two gable end walls near the Whalebone Inn on Wincolmlee in Hull city centre. David Harrison from Bankside Gallery said the group "just dreamt up [the idea] in a pub". Image caption David Harrison from Bankside Gallery says he hopes for "regeneration around the Banksy through art"
He said Hull City Council had backed the project and was creating a register of interested businesses offering up walls or buildings for painting. Mr Harrison said: "Businesses have been really supportive and lots have come forward donating walls and buildings. "The guys at the Whalebone Inn have offered up two gable ends and are likely to see an economic boost from the project. "The ultimate aim is to create regeneration around the Banksy through art." Bankside Gallery includes two artists from Spray Creative whose work can be seen at Humber Enterprise Park, Ings skate park and Wykeland Beal at Hull Fruit Market.